Among other considerations, we must remark that we are indebted to the holy childhood of Mary for three great favors. The Son of God then about to be born into the world could have created a virgin of perfect age and become incarnate in her. But His infinite goodness towards us obliged Him to choose for His mother a daughter of Adam, just to honor all the human race with three signal favors. 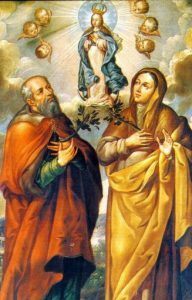 First, by this birth of the infant Mary, divine Bounty gave us two treasures of sanctity, Saint Joachim and Saint Anne. The second favorite is that, by the birth of the holy infant Mary, God bestowed upon the race of Adam another inestimable gift, an immense treasure of good, the holy and precious mother of God, born of Adams race, our sister and our mother. The third favorite consists in the treasure of Our Lady herself has given us, the God-man, our Brother. Weigh well these three great favors God has given us in the birth of the most holy infant Mary and let these considerations excite in us a great desire to honor our Blessed Lady in every way possible.